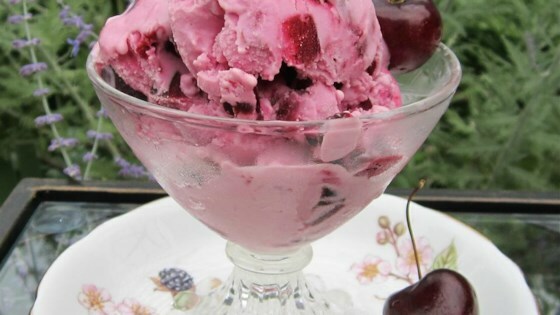 "This fruity frozen yogurt is packed with flavor -- Just stir, freeze, and scoop. If you don't care for cherries, you could add blueberries, strawberries, raspberries, or peaches. ENJOY!!!" Tasted good but even though I mixed it continually while freezing, it ended-up being almost like 1 big ice cube. Would make great popcicles though. Great frozen yogurt recipe, and it was still rich and creamy with low fat cream cheese and low fat yogurt. I used frozen strawberries instead of cherries and chopped them in the food processor. Made this tangy frozen yogurt on the 4th of July weekend. It was luscious and had lots of eye appeal. Will definitely make this again. Thank you.